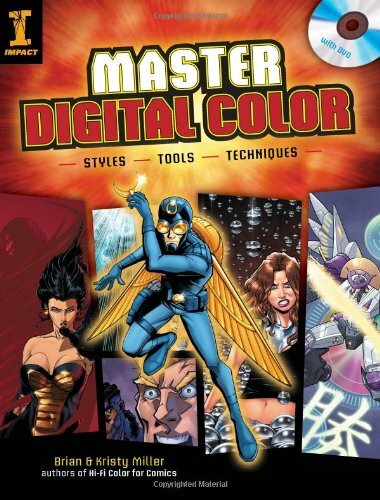 Master Digital Color is a great follow up to Hi-Fi Color for Comics. The first book teaches the basics of digital colouring. This book explores the techniques to colour in different styles, specifically classic animation, superhero, pin-up, sci-fi, manga and alternative. The instructions are written for those using Photoshop (CS and higher). The book also includes a disc with tutorial and script files. The tutorials are all step-by-step complete with screenshots. Lesson files are provided. So it's easy to just follow along. It's a rather intensive course with 16 tutorials. By the end of it, you can get a good idea of the various ways of colouring, and also understand what Photoshop is capable of for digital colouring. Techniques here are more advanced. If you're just starting out, get the first book Hi-Fi Color for Comics. If you need more practice, get this book. Both are highly recommended and among the best books to learn digital colouring.